Principles for driving significant change throughout an entire system Drawing on the knowledge and experience of working with hundreds the world's top social change leaders in all fields, Beverly Schwartz presents a model for change based on five proven principles that any individual leader or organization can apply to bring about deep, lasting and systematic change. Rippling shows how to activate the type of change that is needed to address the critical challenges that threaten to destroy the foundations of our society and planet in these increasingly turbulent times. These actionable principles are brought to life by compelling real-life stories. Schwartz provides a road map that allows anyone to become a changemaker. * Presents some of today's most innovative and effective approaches to solving social and environmental challenges * Offers a vision of social entrepreneurs as role models, catalysts, enablers and recruiters who spread waves system changing solutions throughout society * The author offers a model of change that begins with the end result in mind * First book from an insider at Ashoka, the foremost global organization on social change through social entrepreneurship Rippling clearly demonstrates how and when empathy, creativity, passion, and persistence are combined; significant, life-altering progress is indeed possible. How can we address the critical challenges that threaten to destroy the foundations of our society and planet in these increasingly turbulent times? These actionable principles are brought to life by the book's compelling stories of everyday people who have made real changes around the globe. Throughout the book, Schwartz provides a blueprint to demonstrate how anyone, anywhere, can become an effective changemaker. As Schwartz explains, the next-generation changemakers are in many ways the champions of this movement: the corporations that embrace new and more sustainable ways of doing business; the donors who want their money to effectively and ethically impact people's lives; and the citizens who are trying to make a better life for themselves, their families, their neighbors, and their communities. Rippling presents some of today's most innovative and effective approaches to solving social and environmental challenges, and clearly demonstrates that when empathy, creativity, passion, and persistence are combined, significant, life-altering progress is indeed possible. "Rippling is a wonderful and highly accessible book about people advancing creative and pragmatic solutions to the world's toughest problems. The remarkable breadth of global examples, combined with the depth of Schwartz's observations and analysis, make it a must-read for anyone who wants to understand some of the most powerful forces, ideas, and solution patterns that are reshaping society." "Rippling will resonate with anyone who is eager to know more about how to create an (eco)system for positive change. It will lift your heart and change your outlook on what is possible when one combines innovation with entrepreneurship. Schwartz's skillful storytelling covers the challenges of 'life without' while sharing creative approaches to designing a world that nourishes human potential." 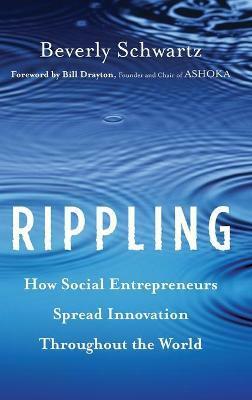 "Rippling is a must-read in the growing but often confusing literature on social entrepreneurship. Writing with great skill and passion, Beverly Schwartz weaves a beautiful tapestry of stories and insights that takes us from the traditional call to change to clear lessons for achieving impact. It is essential reading and will become a classic in the conversation." "Anyone who feels overwhelmed by the thought of making a difference in the world will be reassured by these changemakers, who teach us how small steps can lead to enormous global progress. For all of us who dream of a more equitable, peaceful, and safer world, Rippling is a welcome invitation to hear the voices of changemakers everywhere. It's an inspiring read guaranteed to fill you with hope." "Rippling's concepts are relevant and accessible for businesses of all sizes, from individual entrepreneurs to global corporations. Organizations that tap into the changemaker vision can spark innovation, engage employees, and better meet customer needs while improving the bottom lines for business and society as a whole." --Ronald L. Sargent, chairman and CEO, Staples, Inc.